The Gerald R. Ford Library collects, preserves, and makes accessible to the public a rich body of archival materials on U.S. domestic issues, foreign relations, and political affairs during the Cold War era, focusing on the Ford administration. It also offers a wide variety of special events, speakers, book signings, forums, educational workshops, films, and other programs. And, in addition to the permanent timeline exhibit on the lives of Gerald and Betty Ford, the Library mounts several small temporary exhibits each year. The Library is part of the Presidential libraries system of the National Archives and Records Administration, a Federal agency. Unlike other Presidential libraries, the Ford library’s library and museum components are geographically separate. The Library is located in Ann Arbor, Michigan, on the North Campus of the University of Michigan, while the Museum is in Grand Rapids, Michigan, 130 miles west of Ann Arbor. The 1974-77 Presidential papers of Gerald Ford and his White House staff form the core Ford Library collection. These are supplemented by the pre- and post-presidential papers of Gerald Ford, the papers of Betty Ford, collections of Federal records, and more. Former government officials have donated personal papers, researchers in the period have given copies of research interviews, and private individuals associated with the issues and events of the time have given their materials. Many important materials from our textual and audiovisual collections have been digitized and are now available online. The Library is open to the public without appointment. Advanced consultation with an archivist is recommended to ensure that there are materials relevant to your topic and that those materials are open to research. President Ford's life is told through a permanent exhibit of over 100 seldom-seen documents and photos, plus a biographical film. Grand Rapids' Central High graduate, student of dance, New York model, proud mother, and Congressman's wife. 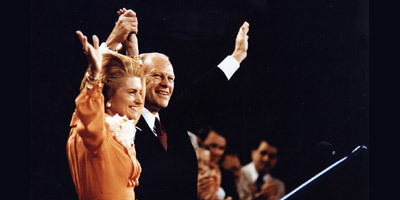 First Lady Betty Ford spoke openly about personal and political issues near and dear to her heart; her courage endeared her to the American people as she found herself in step with the times. Betty Ford never imagined she would be First Lady. She grew up training to be a dancer, then became a Congressman's wife and mother of four children. When she and her husband were thrust into the White House in 1974, Betty was determined to be herself. She spoke honestly, candidly, and courageously to the press and to the American people. She lent her voice to women's rights, children's health, the American arts, and more. Betty faced her own health issues openly and with sincerity. As America watched her move across this unexpected stage, many found themselves in step with Betty Ford. 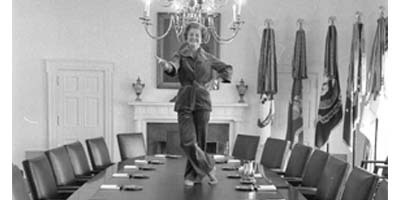 This version of In Step with Betty Ford was created for the Gerald R. Ford Presidential Library in Ann Arbor! To limit executive power, the founding fathers created fixed presidential terms of four years, giving voters regular opportunities to remove their leaders. Even so, Americans have often resorted to more dramatic paths to dis-empower the chief executive. Join us as Ambassador Carla A. Hills discusses today’s trade issues. Over the last two centuries trade has grown remarkably, completely transforming the global economy. Today trade is a fundamental part of economic activity everywhere, yet there is an elevation in trade tensions. Trade partnership are changing. Ambassador Hills will describe the mounting uncertainty regarding the United States-Mexico-Canada Agreement, as well as the nation’s plans to negotiate trade deals with the European Union, the United Kingdom, Japan, and China. She will also reflect on imposed tariffs and the threat of additional ones. Carla Hills, former U.S. Trade Representative serving under George H.W. Bush, also served as Secretary of Housing and Urban Development in the Ford Administration. Currently she is Chair and Chief Executive of Hills & Company, advising on investment, trade, and risks abroad. 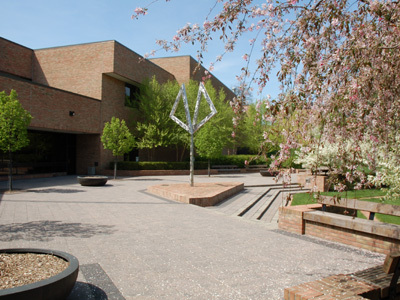 The Ford Library welcomes individual students and classes to visit the Library for educational opportunities. For those unable to visit the Library in person, you can still conduct research using online materials. 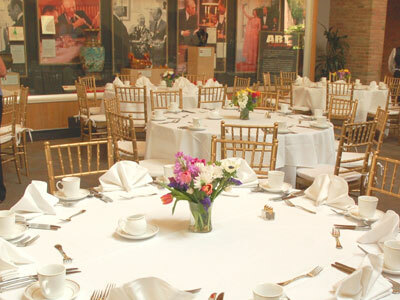 The Gerald R. Ford Presidential Library, conveniently located on the University of Michigan's North Campus, offers a prestigious venue for a meeting, reception, or dinner. Note: The Ford Library is not accepting event rental requests at this time. For more information or questions, please email Gerald R. Ford Presidential Library and Museum Deputy Director Joel Westphal. The expansive main lobby of the Library is an exceptional setting for dinners, special addresses, and receptions. A variety of permanent and temporary exhibits serve as an impressive backdrop. The 1,700 square foot stage and audio/visual equipped auditorium has the versatility to accommodate symposiums, educational presentations, cultural events, award ceremonies, and musical performances, among others. 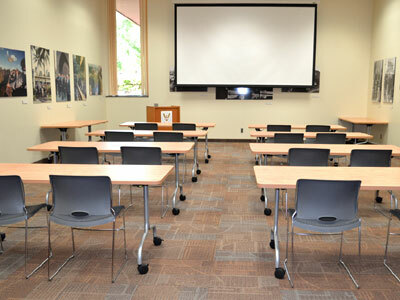 These areas are ideal for meetings and seminars where participants need a classroom atmosphere and set-up. The classroom can be divided into two rooms, with excellent layout possibilities. 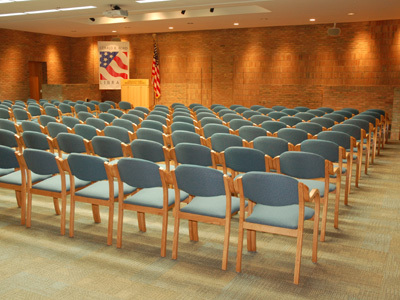 For seasonal functions, the Gerald R. Ford Presidential Library grounds are available. The patio, well-groomed lawn and garden backdrop offer the perfect venue for more casual company events. General availability for all spaces is Monday – Friday between the hours of 8 AM – 9 PM. Contact the Library for information about scheduling an event, rental fee structure, or to review regulations on use of the facility and the application process. Events must be consistent with the public perception of the Museum as an educational, research, or cultural institution (no weddings, proms, or similar events). The Library accepts a limited number of college work-study students, interns, and volunteers each year to assist with processing, preservation, and digitization of textual and audiovisual holdings. Student workers, eligible for the College Work-Study Program at the University of Michigan, and interns are often graduate students in archival studies, while volunteers range from high school students to retirees.